GetJar and Yahoo have announced a link-up which will see all of GetJar's apps appear in the search results of Yahoo Mobile. In a deal that the companies are calling a 'first of its kind', GetJar is hoping that melding information about its apps on to Yahoo Mobile will increase awareness of the site and the content that is on offer. The search results for the apps - of which there are 75,000 - will work by keyword. So if you search 'sport', then a bunch of sport-related apps will appear. GetJar is a third-party app store that offers up all of its content for free, with the apps coming with adverts. It made headlines last month when it was the store chosen by Rovi to host Angry Birds for Android. It was picked instead of Google's own Android Market and it meant the store had exclusivity of the game for a limited time. 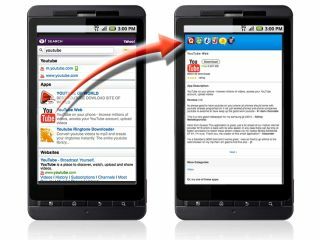 The Yahoo Search integration looks likely to come to the UK in 2011.